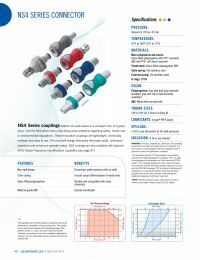 NS4 Series couplings feature non-spill valves in a compact size, at a great price. Use the NS4 when even a few drops pose problems regarding safety, media cost or environmental regulations. These innovative couplings are lightweight, chemically resistant and easy to use. The nonspill design effectively eliminates spills, minimizes downtime and enhances operator safety.